Sol, playa, la mágica noche de San Juan, excelente compañía, el primer baño del verano, sin horarios, sin prisas… ¿qué más se puede pedir para un perfecto fin de semana? Sun, the beach, Midsummer’s eve party, the best company, the first sea bath of the summer, no stress, no rush… what else can you need for a perfect weekend?? What else do you need? Just the perfect dress but you have that already.Very fiqure flattering! y tienes toda la razon con lo de la crema solar!! come by and lets follow each other if you love to do dear! Thanks very much, following you! Do you want to follow each other via GFC? hihi just tag me if you want to. El vestido es precioso, sobre todo el color! Además el azul favorece muchísimo a las morenas verdad?? Mil gracias por tu comentario en mi blog, por supuesto que nos podemos seguir mutuamente, yo te sigo desde ya! You look so cute in that hat. Love the dress! What a beautiful, rich color. I really like the dress. Love your sunglasses! You look ready for summer! Yes ma'am! No sunbathing without sunscreen, I used to in my younger days but no way! Love the blue dress, the style is gorgeous, and I love the bag too! ohh I love these two colors together. they pair nicely! love the dress too miss! Lovely dress and great photos! 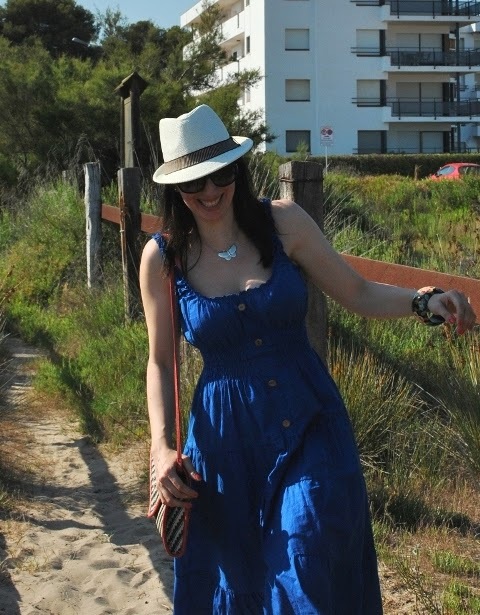 a flowing dress and a cute hat, what could be better for the beach!! Que vestido tan bonito!!! y las fotos son muy buenas!! jaja El bolsito es moniiisimo!!! Por cierto, te sigo!SI quieres pasate por mi blog y si te gusta, quedate!! Un besoo!! lovely lovely dress! maybe we can fallow each other? im fallowing youa already! 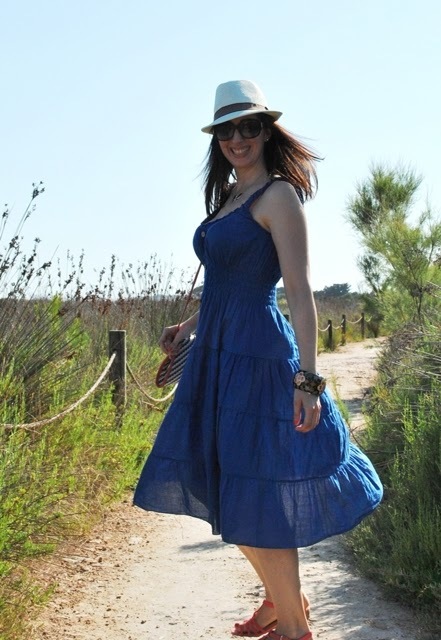 What a perfect summer dress. It looks lightweight and lovely. I love this beach look and I love the background too. Your dress is so cute and a great color too. I have one just like it in white. ;) Love it! Cute look! Loving the color of your dress and your bag! No conocía tu blog pero me encanta, así que me quedo con GFC, me sigues tu también? Me haría mucha ilusión! You're absolutely gorgeus! Great post.